Running and managing a business is stressful enough when you’re only focusing on business goals related to strategic marketing and sales growth. But when you throw in slow networks, storage limitations, and failed backups; your business is suddenly facing many more hurdles to success and it can be hard to know what direction to take in terms of your IT solutions, or to even identify what’s the source of the problem. It can be tempting to call an IT expert and throw some money at the problem; and that may well work, but you’ll spend a lot of money to get there. You’ll save yourself a lot of time and money in the long run if you take the time to understand the heart of the issue and what’s causing it. You don’t need to be an IT expert to do so, either. 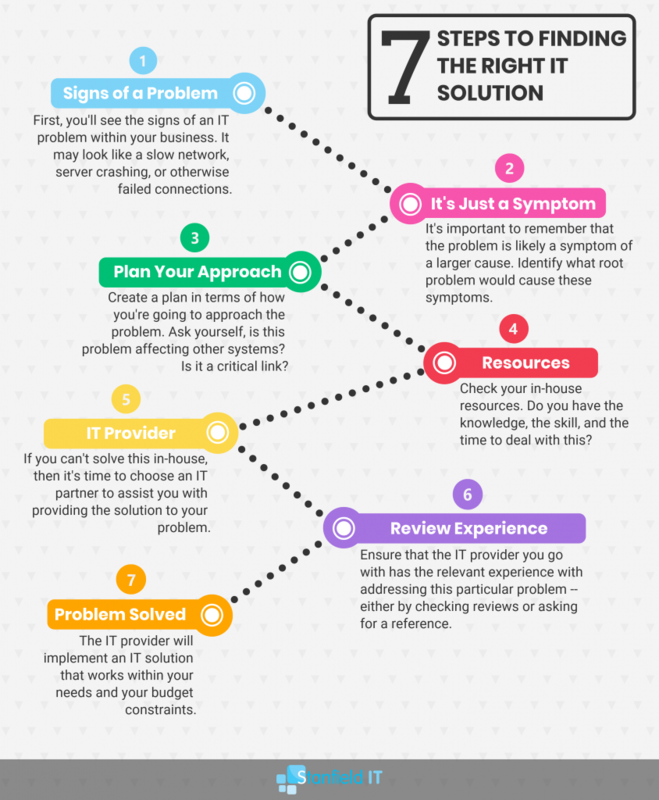 We’ll take you through the process of identifying an IT issue, getting to the heart of it, and how to go about getting the right IT solutions for that particular problem. Identifying that a problem exists is usually pretty simple as you’ll often experience the symptoms of it clearly. It could manifest as failed connections, slow uploads, server crashes, backup failures and more. Some signs may be less obvious however, and it may take some time to identify the source. Ultimately, it’s up to you if you want to take the time to dig into it, but the benefit ultimately lies in growing your knowledge base for future incidents. Knowing the problem, means you’re likely to know which IT solutions apply. Before you run around trying to figure out IT solutions for these issues, you have to stop and realise that these are not your problems. They are the symptoms of a root problem. Are you able to identify what is actually causing these issues? Possible Cause: The system has been infected with a virus or some other malware. Could also be an overheated PC, or outdated computer. Possible Cause: You may have an incompatible router, or an internet connection insufficient for your needs. Possible Cause: File corruption caused by a virus, or old/damaged hardware. Could also be due to any improper shutdown (e.g. due to unexpected outage), or server/cloud issues. Possible Cause: Your company may have outgrown your IT infrastructure. Symptom: Unable to retrieve lost files, data, or unable to function after a cyber incident. Possible Cause: No scheduled backups (with regular testing), no business continuity plan in place. – Does it interact with other systems? – How severe is the problem? – Is it completely non-functional, or just an inconvenience? – Is it a crucial link in the network? – Do other users/functions rely on that system to work? Once you’ve answered these questions, you’ll be able to quickly pinpoint how urgently this issue needs to be handled. This will give you some direction in terms of finding the right set of IT solutions. 4. Do You Have The IT Solutions? Do you have the knowledge and resources to handle this issue in-house? For some simple problems, that may be the case, but for revamping your network infrastructure or implementing an SDWAN solution; you’ll need to turn to an IT services provider. Following on from our examples above, what sort of IT solutions are you going to be looking at? Solution: Total overhaul of cyber security environment, implement backup restore, quarantine and contain the infection. Solution: Restructuring network infrastructure, network optimisation and configuration. Solution: Create a scheduled backup system with periodic testing, and develop a business continuity plan for your IT functions after an incident. Solution: Implement an SDWANsolution for your office and any additional sites you may have. At this point, it’s starting to become clear that you’ll need to employ an external IT solutions provider in order to get the right fix for your problems. Overhauling an entire structure within a business, such as the network, or cyber security environment — is hugely daunting and many of us may not know where to start. However, you did some of the legwork already and you’re heading into the next step armed with significant knowledge. 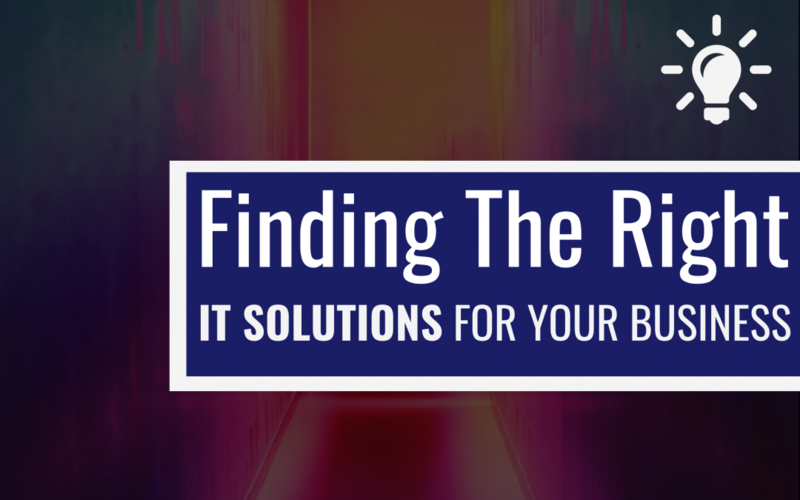 We’ve already written about find the right IT provider for your IT solutions, so we won’t dig too deeply into it here. But essentially, you’ll need to evaluate how well the IT provider suits your needs, but also evaluate their knowledge and ensure that they have the relevant experience to effectively implement the solution you need. Don’t go to an IT provider who focuses solely on general help-desk queries, when you need an entire network to be designed and built. Find one who can provide examples of the work they’ve done. Once you have your IT solutions implemented by your provider, it may be beneficial to look into employing the same team (or another of your choosing) into providing ongoing IT managed services. Moving away from a break-fix model is more beneficial for your business in many ways. Prevention and maintenance go a long way towards keeping your IT running at optimal conditions, and ultimately far less downtime caused by broken internet, servers, or other hardware headaches. Being proactive, rather than reactive will set you forward significantly in the long run and put you ahead of your competitors.